The Cutter effect cuts out a portion of an image using a matte drawing. You can use the Cutter effect to allow a character to disappear behind a background element or to cut a virtual hole into the layer itself. The Cutter requires a matte input. Adjust the Cutter properties to invert the effect of the matte on an image. Instead of the object being hidden by the mask, it will only be visible where it intersects with the matte shape area. 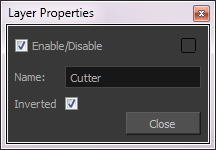 Click the Add Layers button and select Effects > Cutter. Display the Cutter properties and adjust the properties to control the type and amount of blur and the colour of the Cutter effect. Allows you to change the node's name. When this option is enabled, the Cutter node will invert the matte shape to cut the drawing. Instead of cutting the image intersecting with the matte, it will cut any artwork outside of the matte shape.